This is the quickest, easiest and most delicious way to cook a turkey breast. 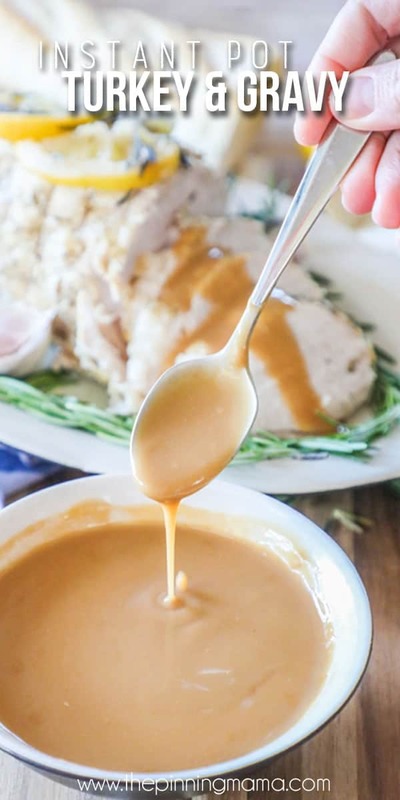 This Instant Pot Turkey Breast & Gravy recipe is a fool-proof way to get a perfectly tender and moist turkey every time. The gravy is made right in the pressure cooker after the turkey is finished cooking so you have your whole main dish made with minimal dishes at the end. I once was scared of my Instant Pot. It’s true! I bought it but it sat there in the box for at least a month, then finally came out of the box to sit for another 4-5 months until my good friend (and Instant Pot Guru) Tricia from Once a Month Meals told me I HAD TO DO IT! She convinced me it wasn’t going to explode and it was going to work and I was going to love what I made with it. So I did, and I liked it, and it wasn’t too hard, and the best part… it didn’t explode! 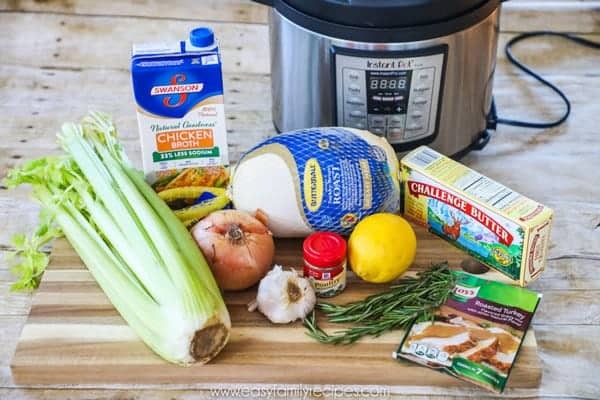 I have gone on my little Instant Pot journey slowly… I don’t know if any of you can relate, but now I use it quite frequently for everything from hard boiled eggs to Thanksgiving Turkey! Now about that turkey…. The beauty of this recipe is that first and foremost, it is delicious. It is sometimes hard to get a perfectly tender and moist turkey, especially the white meat, and this one is that and more! The other great thing is that you can either use this as the main dish for your Thanksgiving get together or as an addition if you think one turkey might not be enough, but two would be too many. I absolutely love that you do the whole thing in your pressure cooker so you aren’t taking up any additional oven space or resources. I also love this recipe for Christmas since it is so hands off. You can get it going in about 5 minutes then go back to your family instead of slaving away in the kitchen. Using this recipe you cook the turkey breast from completely frozen to perfectly tender and cooked in a little over an hour start to finish. I absolutely love this because I am not one that remembers to thaw things 3 days in advance. BUT, with that said, if your Turkey is thawed, you will most definitely need to adjust the cook time on this recipe down. This isn’t one of those Instant Pot recipes where you have a million steps and have to keep coming back to do things and you think, “Was this really easier?” This is a set it and forget it recipe! One you pop the turkey in there, you set it to cook and come back to a perfectly done bird. With the combo of so crazy easy and so crazy delicious, we are actually eating turkey as part of our regular meal rotation now. 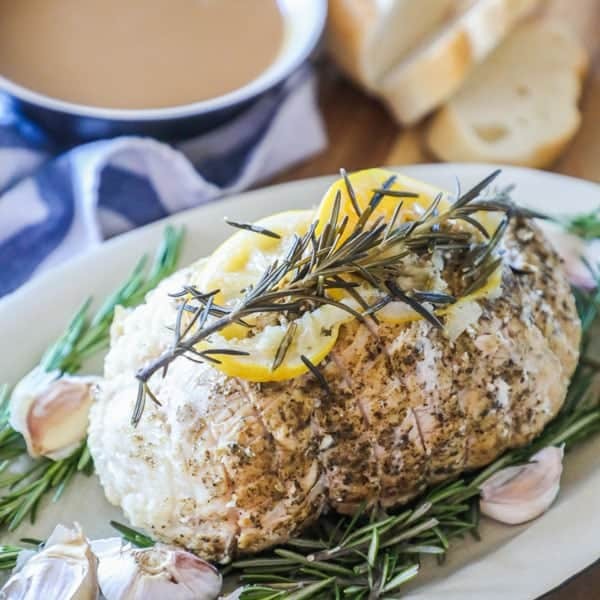 This recipe and the Instant Pot just make this so simple that it is perfect for a Sunday dinner, impressive enough for guests, and tasty enough for your kids to gobble up on any regular old Wednesday. As a bonus, the clean up is easy and the leftovers can be made into about a zillion yummy things to make lunches and dinners later in the week. Now let’s get into the step by step directions. I am going to walk you through everything, but if you have a question feel free to leave me a note in the comments and I will try to answer it for you. If you just want the super quick version, feel free to scroll down to the recipe card at the bottom of this post. 1 (3lb) Butterball Turkey Breast Roast- These are usually found in the freezer section right next the whole Turkeys or in the meat section. I find that Butterball is the most common brand in my area and it comes standard in the 3 lb size. It is important to note that the turkey breast will be cooked from frozen so you can keep it in the freezer. If the turkey breast is thawed, you will need to adjust the cook time below. 2 tbsp butter, cut into pats- I use regular salted stick butter. 2 lemon slices (optional)- I love the flavor of lemon with turkey so I include these, but if you don’t have lemon on hand don’t worry… it will still be great. One note, be cautious on your use of lemon. You don’t want to use too much because if pieces cook in the bottom it will make the gravy bitter. 1 sprig fresh rosemary- I think rosemary is pretty easy to find year round in the produce section and is another flavor that compliments turkey really well. Again, this could be optional. 1 onion, quartered- Any kind of onion you have on hand will do! You don’t have to worry about chopping the onion more than rough quarters because it is just going to flavor the broth with use to make the gravy. 3 stalks chopped celery- This is another thing that will flavor the gravy so a rough chop will do! 4 garlic cloves- Also for flavor, I find it easy to just toss these in whole. 2 cups chicken broth- I used Swanson’s here but you can also make your own homemade chicken broth super easily! Remove the packaging from the turkey. This is usually an outer plastic netting and a plastic type wrapper. I use kitchen shears to snip them both off. Then run the frozen turkey breast under warm water until you can separate and remove the gravy packet from the turkey breast. You can leave the inner netting on while cooking. Rub the outside of the chicken with the poultry seasoning so that it is as evenly covered as possible, and set aside to prepare the Instant Pot. Place the chopped celery, onion, garlic cloves, and chicken broth in the bottom of the pressure cooker pot. Place the trivet in and set the turkey breast roast on top of it. Most pressure cookers come with a trivet when you buy them, but if you don’t have one, you can get an Instant Pot trivet here inexpensively. 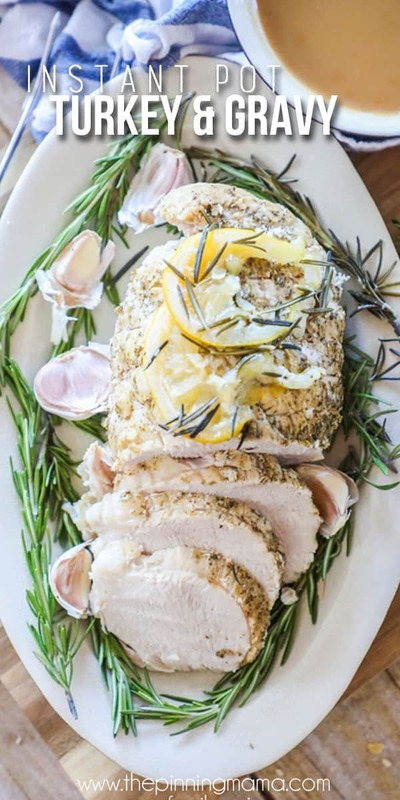 Once you place the turkey breast in the Instant Pot, layer the butter pats, then lemon slices and finally the rosemary on top of the turkey breast. Try to place it as evenly on the top as possible so it doesn’t fall while cooking. Important Note: I am located at sea level and 50 minutes cooks my Turkey Breast perfectly. If you are at a higher elevation, you might want to cook for 55 minutes or at an extra high elevation, 60 minutes to ensure it is done. Remove the roast and strain the vegetables, reserving the broth, and pour it back into the pressure cooker pot and then add both gravy mixes. Turn the pot on to sauté and whisk continuously until it comes to a boil and then about 3-5 additional minutes until it thickens. The key is just to keep whisking to keep the gravy nice and smooth. Turn the pressure cooker off and remove the gravy from the heat. Once the gravy is removed from the heat it will continue to thicken as it sits as well. Last, use scissors to carefully cut off the netting. It will be hot so be cautious! I like to let my turkey rest for about 10 minutes then I carve it up into about 1/4-1/2 in slices and serve warm with as little or as much gravy as you want! Enjoy! I hope that you get a chance to try this one out for your holiday celebration… or maybe just because it is Wednesday! If you do, I would love it if you left me a note in the comments to let me know how you liked it. I absolutely love to hear when others make my recipes. Nothing warms my heart more! Also, if you are on Instagram, I would love for you to snap a pic and share it on your feed or stories and make sure to tag me @easyfamilyrecipes so I can see! 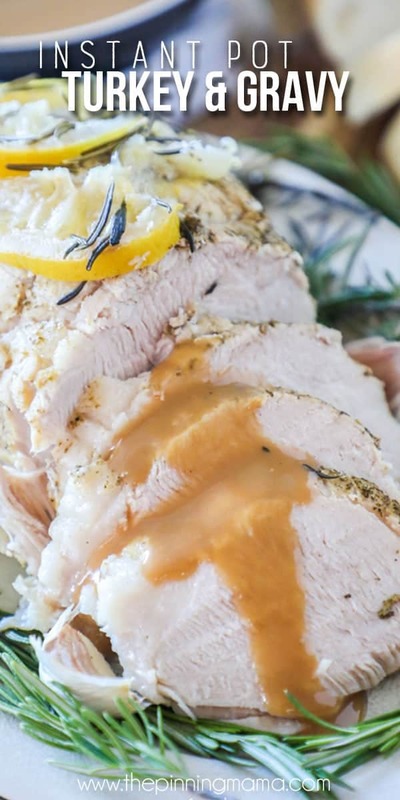 This tender Turkey Breast with Gravy comes together in just a few minutes and cooks to perfection in the Instant Pot. This Turkey Breast is tender, moist and full of flavor. It is delicious! It makes the perfect main dish for a holiday menu or a wholesome addition to a weeknight meal. IMPORTANT NOTE: I have made this many times cooking it for 50 minutes with it turning out perfectly. I am located at sea level. If you are in a higher altitude, you may need to raise the cook time about 5-10 minutes. Is this a boneless turkey breast? Yes it is, I just purchased one yesterday and then this recipe popped up. Can’t wait to try this. From the picture of her ingredients, it looks like she used a turkey “roast,” so yes, it is boneless. I’m making this tonight with a bone-in breast. I wonder how it will turn out?? Have you done this with a larger turkey breast, I have an 8 qt. Instant Pot? We made this last night and it was very good. The only thing is check the turkey breast before you run it in cold water to get the gravy packet. Not all turkey breasts have the packet inside. We didn’t check and it was ruining the turkey. Our turkey did not have a gravy packet inside. Luckily we thought to read the package directions and stopped. Still, very good and easy for 3 people! With the Butterball turkey roast, the gravy packet is frozen to the outside of the turkey breast and is very, very obvious. What are your thoughts about attempting two roasts this size at the same time in the big 8 qt pot? Would they fit? How might that affect the cooking time? Thanks so much for any insight! I definitely think you will need to add a little time. I haven’t tried this but I would probably add at least 15-20 minutes on. Let me know if you give it a try! How long would you cook for a thawed turkey breast? Our instant pot only has a meat option. Would that work for 45 minutes? I think it probably would. I would use the manual setting and pick high pressure if you can. My Instant Pot does not have a Poultry setting. How should I set it? Is it possible to cook two 3lb Butterball turkey breasts and if so how would I adjust the cooking time? So excited to try this!! I have the same question!! Hopefully this allow me to follow along for her response. I can tell you I’ve done 2, frozen, probably 3 lb ish pot roasts and they were still good….I probably should’ve left them to cook a little longer than i did though. I went ahead and did the two roasts in the 6 quart. The only ingredient change was adding the extra roast. I originally set it for 45 minutes. It took 15 minutes to come to pressure and cooked for the 45 minutes then about 20 minutes to naturally release. The internal temperature was 140 degrees in both roasts so I set it again for 12 minutes on the poultry setting and it got up to 183 degrees. I’m thinking if you did it all at once though, you’d want to do an hour of cook time since coming up to pressure and going through release a second time adds a lot of “cooking” time. I don’t have any more roasts to try but if I do, I will try it again. I just thought I’d share what I did with 2 roasts in the pot. I have 2 questions: First, I bought 2 Butterball turkey roasts that have both light and dark meat. Do you think they will cook the same as the all-breast meat ones? And secondly, if I put both roasts (about 6 lbs total) in my 8-quart IP together, do I need to adjust the time? I’m just home from the butchers with a 2 lb boneless breast. Question 2-What time do you recommend for 2 lbs? Would you just cut the time in half if it was thawed? Thanks for a great recipe ! I would probably try about 30-35 minutes if it was thawed. I haven’t done it so it would be a little bit of trial and error though. I”m not sure what happened with mine. I followed the directions to the letter, had the exact same frozen butterball 3lb turkey breast roast. AFter 45 minutes, plus 20 natural release it was 118 in the middle. I’m at a total loss. Definitely got up to pressure, sealed, etc. Anyway, halfed it and put it in for 6 minutes on high pressure and it cooked just through to 180. Delicious, and still fairly moist. Has anyone tried searing the outdide of the Turkey before cooking? It would still be frozen but the outside would have a “ crust.” Making this today!! I haven’t done it this way, but I would lean toward popping it in the oven on broil for a few minutes after it is cooked. I have done this before and it works well. How long would you program for a 7# turkey breast? This was a complete flop for me, but I realize that I am new to this new fad. I thought I followed the directions, but my turkey was not cooked. I finished cooking it in the oven. I’m sure this was user error and not the recipe, and I will have to give it another try. I made this using a THAWED 3lb turkey roast. The IP book called for only 25 mins of “cook time,” but I found it really needed 40 mins of “cook time.” I would follow this recipe for cooking instructions and only reduce the cook time by a few minutes. I am at an altitude if 5,846. I placed roast in oven to broil a few minutes for a crispier skin. I made this for dinner tonight and overall it turned out good, but I think the tablespoon of poultry seasoning was too much. If I make it again I will either greatly reduce the amount of poultry seasoning or eliminate it altogether and go with salt and pepper instead. Since the poultry seasoning is sprinkled and rubbed on the turkey I find that some of it naturally falls off as it is applied, but I always start with a tablespoon myself. If you prefer a lighter seasoning you can definitely reduce the poultry seasoning to your preference. Thanks for that tip…going to try this today and that seemed like a lot of seasoning to me! I have made this twice now and it has turned out perfect each time. My family keeps asking for it again so we will probably make it again soon if I can keep finding turkey at the store. I can’t believe how easy it is to make so I just had to say thank you! I made this recipe and it was good but I threw away the gravy package that came with the turkey but used the two McCormick gravy packets. Was that correct or should I have used the gravy that came with the turkey too? That is exactly what I did. I hope you enjoyed it! Maybe a silly question…but is this a boneless breast? I want to do the kind with the bones still in it. Would that require an adjustment to the cooking time? I just used a frozen 3lb boneless, skinless breast. Not sure if cooking time would change with a boned breast. I just made this tonight in my Instant Pot. I very specifically did EVERYTHING to a T, and the turkey looked perfect when I opened the pot. Upon cutting into the center to check (my thermometer wasn’t quite getting up to temp. ), it was still raw. I put it back in for an additional 12 minutes, and the next time I pulled it out it was beyond perfect. The only difference I can tell is that my turkey didn’t have the string around it when I opened. It was a Butterball, but was wrapped in a special bag that it was supposed to be roasted in, but I took that off. So in all, my pressure time was 57 minutes, but it was excellent. I used a 6.5lb turkey breast(frozen), used time and everything s recipe calls for. Turned out Great! Hi! 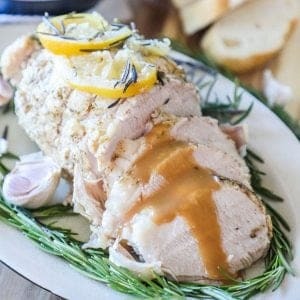 I am getting ready to make this and noticed that I just picked up an almost 9 ib frozen turkey. follow the directions- that it turns out!! Isn’t there a meat chart for frozen vs. room temp. I’m looking for 6lb. Turkey breast. I live in Canada and the Butterball turkey breasts here are 3.3 pounds, not 3 pounds. My turkey needed an extra 10 minutes in the Instant Pot because it was still slightly pink in the middle. Turned out tmoist and delicious. Thanks for saving me hours! I too, would like a chart that compares times for boned and boneless, frozen and thawed and per pound. I have an 8 pound breast with bones and wonder how long I should cook it from a frozen state. I have tried many times to find out how many minutes to cook a 5 or 6 pound frozen turkey breast, but can’t find any info? I can find recipes for the 3lb Butterball frozen breasts but nothing for any size over that. I have the 8 qt Instant Pot and want to cook something bigger than a 3 lb. How many more minutes should be added per pound for larger frozen turkey breasts? Please , I am sure that many more people are wondering the same thing. Question: This is my first time to use the instant pot. I have a THAWED 3 lb turkey breast. The recipe says to use a frozen turkey breast. But if you use a thawed turkey breast to down the time —but it doesn’t say by how much. Does anyone know? I have to mention one thing: I had a really tough time getting the gravy packet out of the frozen turkey breast. I wound up soaking the breast in cool water and replacing the water several times before I was able to dig the remaining portions of the gravy packet out. It certainly made for a difficult time. Thank you for this recipe. This is the first recipe I tried in my instant pot. It turned out delicious! So glad to hear that! The Instant Pot can be intimidating at first but it really is such a great tool once you get over the learning curve! For those people who were asking about thawed AND more than one boneless turkey breast at a time – I used 2 3lb turkey breasts that were thawed and placed both in the IP as directed. I also do not have a poultry setting on mine, so I used the meat/stew button instead and set it for 40 minutes. Vented for about 10-15 minutes or so. Came out great. I did not use the poultry seasoning, lemon, or rosemary because the Butterballs I bought were herbed already in the package. i will have to try from frozen next time. I had already thawed because I had just assumed that whatever recipe I was going to follow would call for thawed. It was after I thawed that I discovered this recipe. Is the gravy packet with the turkey discarded? I notice the recipe says add two gravy mixes which I assume is the McCormick.